This clean and classic design is adaptable to any RV decor style. Our Captains Chairs offer you.. Designed for your next big adventure, this seat makes an excellent travel companion. Our C.. Perfect for your next cross-country trip, this design combines years of expertise in the vehicle sea..
Navigate your journey in comfort from this well-tailored bucket seat. 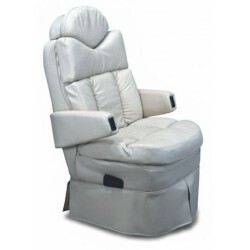 Our passenger chairs offer you..
Our Captains Chairs offer you the finest in automotive styling and ergonomic comfort. The cushioning.. The perfect cross-country companion, this bucket seat features industry-leading support in a simple.. This top-selling Flexsteel Captain’s Chair features a shallow pillow-back style that provides e.. Built to last, this bucket seat offers a timeless look for your motor home. Featuring adjustab.. Perfect for your next cross-country trip, this design combines years of expertise in the vehicle.. Expert tailoring and indurstry-leading design make this bucket seat a premium choice for any road w..